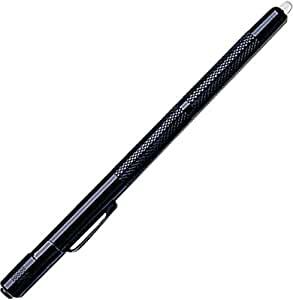 Compact and lightweight, the streamline Stylus is a portable penlight with a high-intensity LED that lasts up to 100,000 hours. 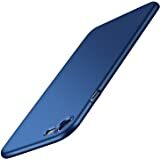 It is designed for comfort and durability with a waterproof, machined aluminum case and a pocket clip for easy portability. Featuring momentary-blink and constant-on switches, the Stylus penlight has different-colored LEDs available (each sold separately), so you can use it in a variety of applications at home or at work. A lighting tool for the 21st century, the elegant Streamlight Stylus combines the convenience of an ultra-slim pen light with a high intensity LED which lasts 100,000 hours. 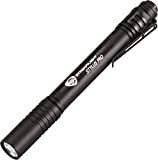 Perfect for tactical use and covert operations, while preserving precious night vision, Stylus runs up to 60 hours. It's waterproof, machined aluminum case comes in black, gold or silver and has a momentary blink switch plus constant "on". The 3-cell version measures 6 1/2-inches and weighs 1.1 ounces. Each Stylus is individually serialized, and features a pocket clip as well as a lifetime warranty. Carry Stylus anywhere. It's the dependable, comfortable lighting companion. Accessory pack includes Glare Guard, Holster, Sharp Spot. Battery: Three AAAA alkaline batteries; Bulb: 100,000 hour lifetime, hi-intensity Light Emitting Diode (LED), "solid-state bulb"; LED: White; Body: Black; Material: 6000 series tempered aircraft aluminum with anodized finish; non-slip knurled grip; Weight: (with batteries) 1.1 Ounce; Dimensions: 1/4-inch (Diameter) by 6 1/4-inches (Length); Run Time: up to 60 hours; Power: White 10 lumens; Special Features: Waterproof; individually serialized; momentary blink switch and constant "on"; pocket clip; blister packaged. WHICH LED COLOR IS RIGHT FOR YOU? White - Most popular for all-around use. Very close to natural light, which allows you to see "true color"; Green - Extremely bright. Great for outdoors because it preserves night vision. For hunters it won't spook game; Blue - Extremely bright yet easy on the eyes. Ideal for various industrial and automotive applications. Also commonly used in forensics; Red - Ideal for signaling. Preserves night vision. Very handy flashlight to carry around in a pocket. Bright light from a small flashlight. 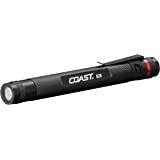 Although AAAA batteries are hard to find, this flashlight uses batteries at a very slow rate. Order extra batteries with light and you'll be good for a couple of years. 5.0 out of 5 starsVery nice light! Great light to have building maintenance people. 5.0 out of 5 starsSuper bright! Very solid and good quality.